*The eruptions have halted and there is no more danger of lava activity or poor air quality. 9/6/18. A private studio cottage situated at the back of a one acre property. Surrounded by thick vegetation, you feel like you're in the jungle! Vaulted wood ceilings with exposed beams and optional dim mood lighting are two wonderful features. Garden views surround from the 384sqft. lanai, giving you peace and privacy. Included on the lanai is a hammock for 2 (up to 500 lbs. ), a portable gas BBQ grill that can be taken with you for day trips, patio furniture with mosquito net umbrella cover, wheeled cooler, beach mats, beach towels, snorkels and masks, beach chairs, 3 boogie boards, large beach umbrella and 2 large umbrellas for rainy days. The lanai is 8 feet wide and runs along two sides of the cottage, extending the living space. A roof overhang of 4 feet protects the lanai on rainy days so you can still enjoy being outside without getting wet. Listen to the roosters and other sounds of nature as you relax with your tea or coffee. If you have children they are welcome to jump on the trampoline located in the main house's yard. There are many sounds of nature all around us, primarily Hawaiian dove, coqui frogs at night, crickets, birds, and other frogs. We have small hobby farms on each side of us, so you will also hear their dogs, ducks, goats, chickens and roosters. I realize roosters can be very annoying if you are not used to them, so I have two fans in the unit that can be used to help muffle the sounds. As of March 14, 2017 there is also a sound machine with 10 different sound scenarios that is very effective in covering the roosters crowing. Roosters are very common throughout the Puna district - I've even heard them inside the Hilo airport post office! If roosters are a concern you want to avoid, be sure to ask your potential hosts about their own or neighboring roosters. Inside sleeps up to 4 with a queen-size bed and full-size sleeper/love seat. The sleeper is a very comfortable foam mattress with no bar to jab you in the back all night. It can fit up to 3 medium-sized people as a love seat, 2 as a bed. The queen bed is medium firmness with a center reinforcement for back support and I've added a foam/memory foam pad and plush mattress cover for added comfort. There is a portable playard with sheet and mattress pad for the babies. There is no A/C, however, there are two stand fans and a ceiling fan to help keep cool. Dish satellite TV and internet are included. The TV is a 39" LED/HDTV with 120 channels. Full kitchen with gas stove, oven, refrigerator. It is fully stocked with pots and pans, utensils for eating and cooking, rice maker, microwave, coffee maker and Starbucks coffee, blender, bagel sized toaster, 25 spices, and purified water dispenser. Dishes are a service for 4, including plates, bowls, wooden salad bowls, large coffee mugs, glasses, wine glasses, shot glass, and kiddie cups. The bathroom has a shower stall, pedestal sink, laundry basket, plenty of towels, hand towels and wash cloths. Shampoo, conditioner, body wash and baby wash are also provided. The medicine cabinet contains a First Aid Kid, peroxide, and various OTC medications for headache, allergy and itching. Our property also features tankless hot water heaters, so you will not run out of hot water. You are welcome to use our washer and dryer located in the main house carport storage. Laundry soap, bleach, and dryer sheets are provided as well. We provide the book "Hawaii: The Big Island Revealed" so you don't miss any off-the-beaten-path places of interest. Although our location is central to Hilo, the Volcano and the coastlines of lower Puna, this is the BIG ISLAND - it is not The Island of Convenience, lol. In other words, there is no getting out of long drives no matter where you stay. But the drives are along long stretches of rural highways with very few stop signs or stop lights, so it isn't as long as it seems in terms of time. If you're here long enough, you'll get used to it! Getting here is super easy, and on paved roads the whole way. We look forward to seeing you! Please email me if you have any questions or concerns that I may not have addressed here. We are Joel and Karla Nava. I'm 54 and he's 49. Joel and I have been married for 20years and we have one son between us, Lakota, who is 20. I also have 3 other adult children in the mainland and 5 grandchildren. Joel works in I/T and I have been a homemaker for the past 10 years. We took our first vacation to Kauai in 2006 and decided then that we had to live in Hawaii - but which island? So from there we vacationed on Maui in 2010, and Oahu and the Big Island in 2013. We decided that the Hilo side of the Big Island would be home. After a lot of saving up, we returned to the Big Island in Feb 2015 to purchase our new home! 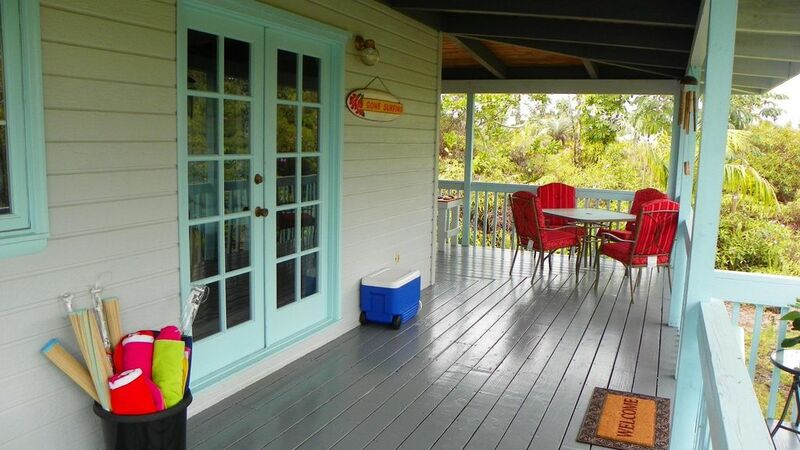 We chose this property because it is central to Hilo, Volcanoes National Park and Pahoa. It also had a separate guest cottage that we could turn into a vacation rental for extra income. It is unique in that it has 4 separate structures on the property - the main house, a detached carport, a work shop, and the guest cottage in the back. (The work shop will not be used while guests are visiting.) We love the tropical lushness and the affordability factor compared to the other islands. Unique benefits for this location is being so close to an active volcano and having 11 of the 13 climate zones right here on one island! You don't have to travel far to be in a whole new world and we love that. If you wake up to endless rain in Hilo, go spend the day on the Kona side or make your way above the clouds and watch the sunset on Mauna Kea! Tip: You will be told that you need a 4WD vehicle to go to the summit of Mauna Kea and this is true, but only after you've reached the Visitor Center at the 9000ft. level. You can drive a non-4WD up to the Visitor's Center but the ascent can be very rough on vehicles, so I recommend that you stop and rest the car every mile or two for about 5 or 10 minutes. The Visitors Center is at the 6th mile. Things to see and do at this level are walking a path through the rare silversword plants and hiking to the top of a cinder cone hill to get a view of Mauna Loa, the clouds below and the sunset. The Visitor's Center also has a gift shop and hot drinks for sale. As for the property itself, we fell in love with the spacious lanais that allow you to enjoy sitting outside in the cool breeze and just taking in all the sounds of nature, no matter if it is the heat of the day or if it is pouring rain. All of our dinners are had out on the lanai! Another great feature is the tankless hot water heaters - no running out of hot water! Shampoo/Conditioner, Body Wash, Baby Wash, plenty of towels, hand towels and wash cloths, First Aid Kit, peroxide, various OTC meds for headache, allergies and itching. 1.5 miles to the lave cliff ocean shore. Great place to watch the ocean and look for sea turtles. You can sometimes hear the ocean from the unit at night. Located in Hawaiian Paradise Park, which is a subdivision of one acre lots a mile away from our lava cliff coast. Mouna Kea is visible from our yard when it isn't covered by clouds. Queen and full sized sheets, blankets and quilts. Top loading. Located in the carport area. Laundry soap, bleach and dryer sheets provided. Love seat/sleeper that sleeps 2, coffee table, 39" LED/HDTV. Full size refrigerator/freezer.. Stocked with a half dozen eggs, butter, half 'n half and a complimentary bottle of white wine. I will substitute the wine on request. 20", 4-burner gas stove and oven. Starbucks French Roast coffee and half and half provided. Service for 4 with plates, bowls, salad bowls, coffee mugs, coffee, glasses, wine glasses, kiddie cups, wine opener, can opener, potato peeler, pastry brush. Full kitchen with coffee maker, coffee, blender, rice maker, microwave oven, toaster, spice rack. Dining can be in the living room on the coffee table or on the lanai furniture. Boom box to plug your device into to listen to your own music. No DVD library, but RedBox rentals are available in Keaau, Pahoa or Hilo. Children's books available and other miscellaneous subjects. Backgammon, checkers, a Hawaiin word game. Garden views with palm trees, banana trees, pineapple plants, lots of pink flowering bushes and trees, wild orchids, red-flowering ohia trees, rustic lava rock grounds. There is a set of stairs you have to climb to reach the entry to the cottage. We were delighted with the comfortable accommodations, the little extras provided by our gracious hostess and the feeling of being in a tropical jungle. We really enjoyed our stay at the Nava cottage in Hilo. The house was clean and beautifully furnished. We loved spending time on the extra large lanai admiring our tropical surroundings. The owner provided a variety of goodies such as eggs, coffee, tea, and creamer to make us feel welcome and we appreciated the thoughtfulness of the owner. We would highly recommend this cottage to future guests. . We would love to visit again in the near future. Thank you Karla for making our time in your lovely cottage extra special. Karla's home was the perfect location for us to explore the Hilo side of the island. We especially enjoyed the stocked refrigerator including eggs and wine. The accommodations were very well thought out. Thank you! Superb! It was a lovely space to relax. Beautiful lanai for having your coffee in the morning . It was a wonderful hidden gem tucked away from the noise of Hilo. Every little thing has been thought through. Secluded in a lush tropical jungle. We spent 33 days in our cute cottage. All we needed was there for us to use. Dining on the Lanai by candle light was a delight. We used this home to launch many adventures. Days were spent checking out waterfalls, black sand beaches, fruit and vegetable markets, volcanos, and lava flows. Favorite places to dine were Kaleo's. Lemongrass, and Pineapples. Karla provides a three ring folder that has many suggestions, maps and recommendations. We took it with us often as well as the provided "Hawaii, The Big Island" which was provided. We really enjoyed the Hilo side of the island before heading to Kona. Be aware, there are chickens but the sound machine works wonders. Future trips will include this private hideaway. Hawaii state law requires us to charge tax at the rate of 13.41%.